On those days when you opt for sweatpants and a sweater as your outfit of choice when heading out to class, you can still keep your dorm accessories in style! Not that there's anything wrong with the comfy college look, but sometimes you'll have to let those fashion accessories keep up the style. With this Catalina Student ID Case, you'll get an interesting blend of blue, white, and red hues to add a nice, decorative touch to your look. Why keep that ID in your pocket? When's the last time someone complimented how stylish your pockets look? That's what we thought. 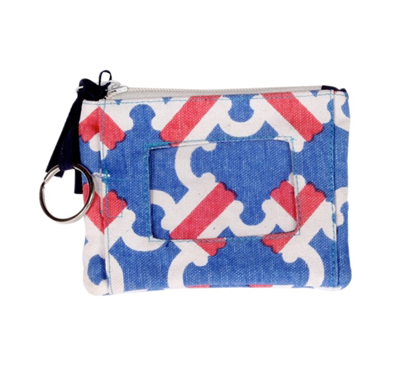 This ID case for college can also double as a wallet, as it's useful for holding, cash, cards, or whatever other smaller college supplies you need to take with you. While many college girls will toss their IDs and other college items in a big purse, you know how long it takes to look through a crammed purse just to find anything. Instead, keep that ID in this cool college ID holder and don't waste all that time fishing. 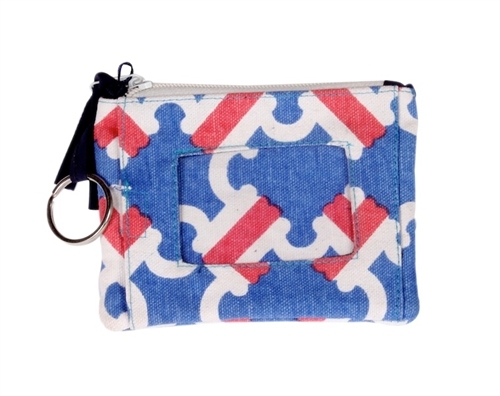 You can also attach this college ID case to your purse or backpack for college with the handy key ring. Indeed, it's the little items for college that can make dorm living the most convenient!